I’m currently in San Francisco visiting friends and being a tourist. Last night we had dinner at Anchor & Hope, an out-of-the-way gem that my beer-savvy friend recommended (based primarily on their stellar draft selections*). We decided to share a few appetizers, and since this was my cheat meal, I was happy to oblige. The cornmeal-fried artichokes were lovely, and the calamari rings were perfect. But the really interesting choice was the Sea Urchin. I had never tried urchin before. It’s always kind of freaked me out, to be honest, especially because only a small part of the animal — the ovaries, no less — is edible. Unlike at a sushi restaurant where it’ll be served raw, this one came with crab legs and a bechamel sauce. In a word, it was decadent. Wondering if I should feel guilty about last night’s binge, I just looked up Urchin on Monterey Bay Aquarium’s Seafood Watch list — and was happy to find that Canadian-caught urchin is a “Best Choice,” and California-caught is a “Good Alternative.” They say to avoid urchin from Maine, however. Speaking of which, apparently over in Maine they call urchin “Whore’s Eggs.” Real classy, Maine. Real classy. Have you had urchin before? What do you think: Delicious or Disgusting? LOVE sea urchin! that looks delicious! 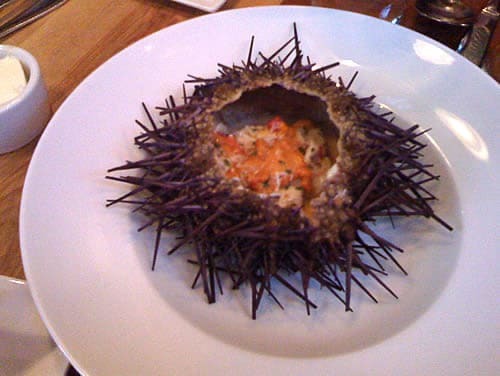 I tried urchin at a sushi restaurant in Monterey back in May. I had resisted it for years because I watched a friend try it about 5 years back, and almost throw up. His best description was that it tasted like the rocks at MDR smell. Needless to say I was pleasantly surprised, it was light, sweet, and creamy. I don’t think it will be a regular thing for me, but on occasion (and at a good restaurant) I’ll order it again. I think I’d want to avoid “whores’ eggs” too. G*d only knows where they’ve been! And I bet lots of things go down easier with crab claws and bechemel. Bravo for trying something new! I’ll pass, thanks. But I do love the presentation! Sounds good. I’ve had the sushi version with quail egg, quite tasty. It’s one of those things, if it’s good it’s good, If it’s bad it’s BAD!! Good stuff tastes like butter!!! Yum! !